I myself have never been the biggest follower of webcomics. I followed Shortpacked daily for the best part of a year at one point, but drifted away from it. And I love Tears of the Dragon by ComixTribe’s Tyler James, but I’ll admit I’m often lax about checking updates every week, more often finding myself reading a collection of pages every few weeks. But still, as an outsider, I can definitely see the appeal of webcomics. In the internet age, it’s easier than ever to make your own comic and publish it. If you can think it, and you can draw it, there’s nothing stopping you putting together your own web page and sharing your webcomic with the world. The downside? In the internet age, it’s easier than ever to make your own comic and publish it. It’s so accessible a format that a good webcomic is going to have to struggle through a lot of crap to get noticed, perhaps even more than they would in the print market. But if you connect with readers, you can connect in a big way: while the average comic book writer might reach his audience with new material once or twice a month, depending on how many comics they are writing, a prolific webcomic creator can become part of his audience’s daily routine. 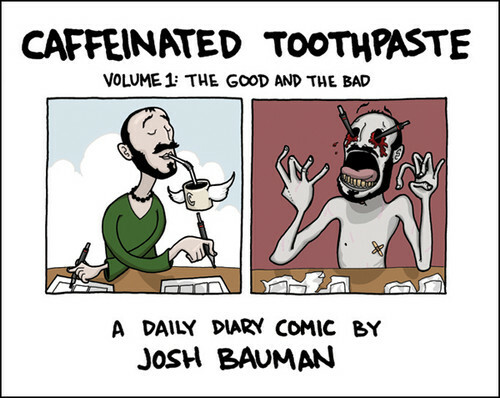 Josh Bauman plays to this particular strength with Caffeinated Toothpaste, his daily, autobiographical diary strip, telling the story of his life as an American living in Germany. In place of fictional characters we have Josh himself, his friends and family, with narrative typically forgone in favour of a simple slice of life. There’s something honest about the way this is all structured. It’s not a Seinfeld­-style “real life” where we have fictionalised approximations of real people whose lives are shaped around a daily gag. This was a bit jarring at first. With the newspaper-strip presentation, I think we have inbuilt expectations that it’s going to end with a punchline. But no, usually it’s just, “this happened today.” That’s not to say there aren’t plenty of laugh-out-loud moments – there are. But there are also plenty of straight-faced depictions of the everyday and the mundane. Our reaction to it – whether it’s to laugh, to be saddened, or to be touched – all stems from the familiarity to our own lives that the episodes spark. As a writer myself, I’ve totally had the experience Josh recounts of looking out the window, remarking on what a beautiful day it is outside, before returning to the computer to get back to work. This familiarity is paired with a sense of intimacy and accessibility: this is real life, Josh is just like the rest of us, and is readily available to converse about the strip of the day on his site. So, I read a strip about Josh’s pet peeve of always wearing the jean with the bleach stain out to work. I reply saying that what I hate is when the crotch of my jeans rips open while I’m out. He then replies saying he hates that too. There’s a kind of connection, not just between reader and creator, but weirdly between reader and character. There are several instances of strips about people Josh meets talking about something that happened in another strip, or even wondering if they’ll be included in the next strip. And so the walls between narrative and the real world are blurred, as this is inevitably a make-believe world – drawn and given life by Josh Bauman – but it is one that anyone from the real world (at least, anyone who encounters Josh) could become a part of. But exploring this process of abstraction takes us off on a fascinating tangent: this is the real world, as it happens, with no staged narrative, but is the very act of Josh choosing what to draw the day’s strip about (quite a few strips centre on this very conundrum) an act of shaping narrative in itself? And as touched on above, the very act of drawing it out makes this an adaptation of reality. And as much as we feel, as readers, that we know Josh, Stephanie and the other recurring players, that Caffeinated Toothpaste lets us know how their life is unfolding each day, what we really know are their cartoon approximations. I kinda don’t want to see what the real Josh Bauman looks like, as I fear like – much as was the case when I saw the real Scott McCloud – it breaks the illusion a bit. For seeing the real version of them makes this cartoon version feel less real. While we’re being philosophical, that creates a bit of a contradiction, where the creator of autobiographical work like Josh is simultaneously more and less visible than a writer of straight fiction. Grant Morrison or Alan Moore, for example, can write about fantastical worlds and out-there concepts, but we have a clear picture in our heads of who they are, what they look like. With Josh Bauman – or Chester Brown, or Joe Sacco, or Marjane Satrapi – we think we know the story of their lives, but because of their insertion into their own narratives we think of them as these cartoons of themselves that they’ve created rather than the physical, flesh-and-bone creator putting it together. It’s a bit like the “uncanny valley” effect, I guess. As it stands, it’s nice thinking that this simply-drawn, black and white little cartoon man with beady white balls for eyes is the “real” Josh Bauman. 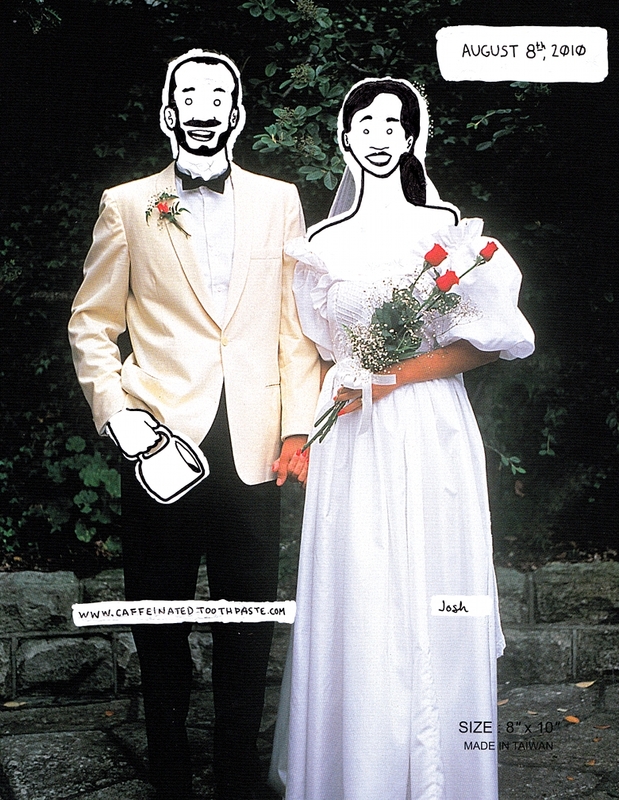 As a result, perhaps the definitive image of the series so far for me is the photograph of Josh and Stephanie’s wedding day, with their cartoon faces superimposed over their real bodies. This is all getting very pretentious and making my head spin a bit, so to get back to the point: Caffeinated Toothpaste is the presentation of an everyday life, and as such, it was always going to rise or fall based on how compelling the life in question is. And for me, I think this soars because of Bauman himself, and his presentation of himself: witty and self-effacing, not self-consciously artistic or making some grand point about himself as I find off-putting in some autobiographical comics I’ve read. He’s likeable, and therefore so is the strip. The writing is unambitious, but can often emerge as quietly poetic. The art is simple and strictly functional for the most part, but then a moment of beauty occasionally slips in out of nowhere and floors you. The very fact that this is slice-of-life autobiographical storytelling lacking in high drama or conventional narrative automatically means it’s not going to be everyone’s cup of tea (or coffee, I should perhaps say). But if this is the kind of thing you are interested in, then Caffeinated Toothpaste is one of the very best examples of it I’ve come across. Caffeinated Toothpaste, Volume 1: The Good and the Bad is a lovely little graphic novel collection sampling some of the best strips from the webcomic’s first year. To preserve the strip layout, it is presented in that cool “landscape” format that the recent Mister Wonderful graphic novel shipped out in: oddly enough, I think the two could make quite nice companion pieces on your coffee table. That’s available from the official website. Once you’ve read that, if you feel inclined to continue following Josh’s daily exploits, check out www.caffeinatedtoothpaste.com.